Address: Toranomon Daini Toyo Bldg. 6F, 1-12-15 Toranomon, Minato-ku, Tokyo, 105-0001 Japan. Directions: From No. 1 or No. 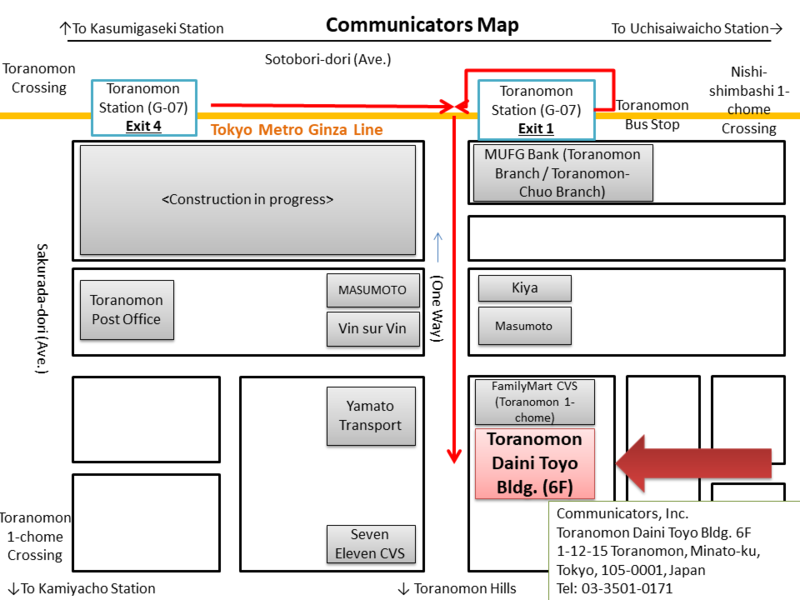 4 Exit of Toranomon Station (G-07) of Tokyo Metro Ginza Line, find the building of the MUFG Bank Toranomon Branch and enter the street that is running besides it (you will see the tower of Toranomon Hills in front of you). Go straight until you find FamilyMart on your left; the next building past that FamilyMart with a short flight of stairs at the entrance is Toranomon Daini Toyo Bldg. Please proceed to the 6th floor by the elevator.